My dad went to his grave telling me I should’ve been a sportswriter. Even though I became an elementary teacher, and he said he was proud of that, he still continued to ask me on a regular basis why I didn’t just “take up” sports writing. We’d be watching a Twins or Cardinals game together and I’d comment on what pitch I thought was coming next. He’d say, “Why don’t you write that down and send it to the Des Moines Register?” I’d look at him without a clue what to say in response. He trained me to read the great sportswriters. During my childhood the sports section of the Des Moines Register was called The Big Peach. It was the color of a newspaper you’d had in your drawer for 20 years, but a little more peach than yellow. Every morning at breakfast my dad read articles from it to me. Our favorite was the column from LA writer Jim Murray. He’d write things like “Walt Frazier’s hands are so fast he could steal hubcaps off moving cars,” and no one thought he was being racist because he wasn’t. My dad would read notable box scores to me and tell me why they were notable, and each time I learned something new. By the time I was in high school, I knew more about national sports than most of the guys around me, unless those guys were my dad’s buddies. I was chosen to edit the high school newspaper my junior year and so got to decide who the sports writer would be, and of course it was me. The mundane part of this job was writing about the local scene: the high school teams. The fun part was writing an essay here or there about my favorite athletes like Brooks Robinson or Babe Didrickson or Walter Hagen. I won an award that summer at journalism camp for an article I wrote about Adrian Dantley, Notre Dame’s All-American power forward from Washington DC’s legendary DeMatha Catholic high school. He was coached by the immortal Morgan Wootten. Wootten has the most wins as a head coach in the history of basketball on any level. His DeMatha team beat Power Memorial Academy, the team of Kareem Abdul Jabbar, then named Lew Alcindor, and ended that school’s 71-game winning streak. His career coaching record stands at 1,274-192. This was the kind of stuff my dad taught me to love writing and talking about. It made some guys afraid of me, but it made me sort of popular with some other guys, usually the ones in bars. When I went off to college at the University of Iowa and majored in journalism, I headed over the Daily Iowan office, ready to join the sports writing team. The editor was a guy who now writes for the Wall Street Journal. You had to be interviewed to be on the staff. By him. When I told him where I was from, and that I wanted to be on the sports writing staff, he said, “We don’t do many articles about 5 on 5 girls basketball here, this is the Big Ten.” Since I was only 18, I looked at him without a clue what to say in response, just like I did with my dad many years later. Now, I have plenty to say to both of them. I should probably get started. *Two Pages is a weekly assignment in my writing class with Abigail Thomas. Wow. Now I'M interested in sports for the first time. You shoulda written about sports. Wait–you just did. Your dad would be proud. And he was right. I have a feeling–as always. Thank you Scads. Love you as always. Sisters in having the Great Dad. Why can't you just live down the block from me? Mentally salivating in anticipation of your 104 pages a year from now. GAH! COME VISIT. SOON. love you. Kitty Sheehan!! My new favorite sports writer. Oh how I miss The Big Peach. Two pages worth reading. Nice job! 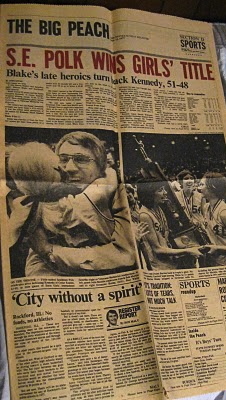 I was also a sportswriter for my high school paper at Marion H.S. I almost lost my job when I penned a smartass poem, “An M on Her Chest,” after our cheerleading squad chanted “What are we going to do? Beat Maquoketa!” in the final minute of a game we were losing by nearly 30 points. Ha!